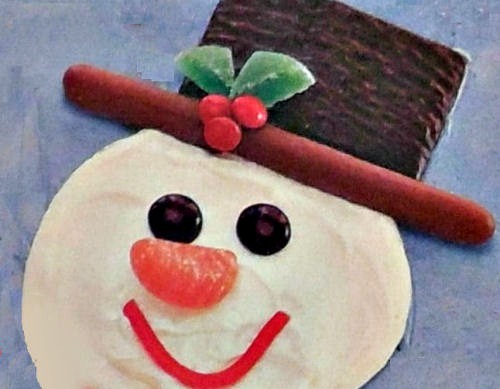 Your kids will love to make this sweet snowman Christmas cake. The cake will be the hit of your Christmas buffet. 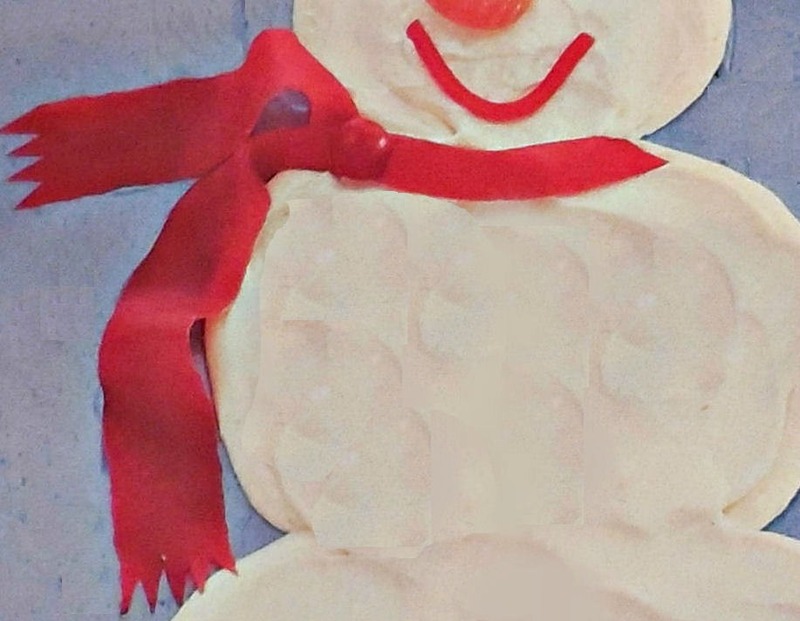 He is made of a chocolate base and covered in butter cream frosting and then decorated. Make your cake by following the recipe below. While the cake is cooling make the butter cream frosting. In a large bowl, with mixer on a low speed, beat all of the ingredients, except the food coloring until just blended. 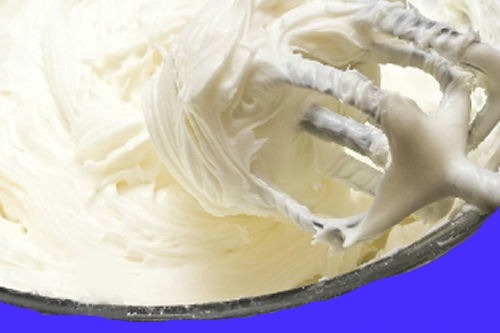 Increase the speed to medium and continue beating until the frosting is smooth and fluffy, about 1 minute. Set aside 1 3/4 cups of the frosting. Tint the remainder of the frosting a sky blue color. 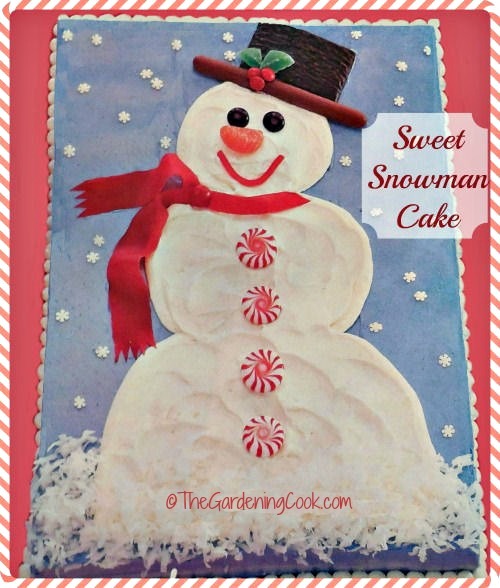 Outline the snowman with a toothpick with frosting on top of the cooled cake. 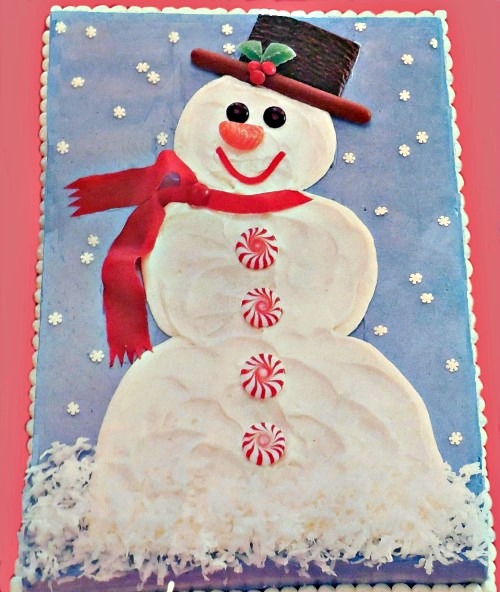 Spread the snowman inside the lines with white frosting being sure to leave some to make the beads around the outside of the cake. 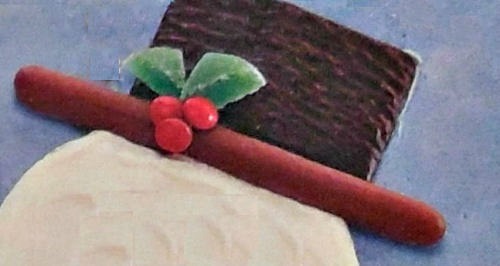 Place the extra frosting in a decorating bag with a #5 beading tip. For the hat: place the wafer cookie bar on a slant on top of the head for the brim of the hat. Place the thin mints, slightly overlapping them above the brim. Cut two triangle from the spearmint jelly candy for holly leaves, and attach to the brim. Add the 3 red mini M& Ms in the center of the holly. Position the Junior Mints for the eyes. Use a piece of the orange jelly candy for the nose. For the mouth arrange a piece of the licorice lace in an upturned position. Cut the fruit roll up for the scarf and place on the neck. Attach the large red M & M on the scarf. 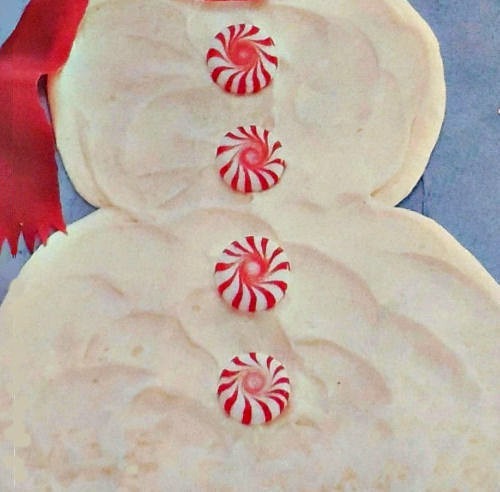 Arrange the peppermint candies on the upper and lower snowman body. Sprinkle sweetened coconut at the base of the cake. Decorate the sky with white star decorating candies. Use the icing in the bag to pipe beads all around the outside of the cake.